We will begin a new Bible study exploring the theology of Martin Luther and the Reformation and its effect on church and society. 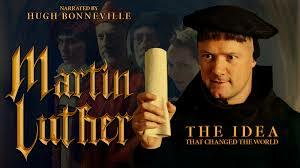 We will be watching the PBS special, Martin Luther, The Idea that changed the world, and exploring some of the Biblical passages that greatly influenced Luther and his colleagues. The study will be interesting for those who are familiar with the Reformation as well as those who are unfamiliar with the Bible. Please plan to join us for this six-week study which begins October 28 at 9:15am.